In just a few minutes, we shall leave the comfort of the Bridge Hotel for the beauty of the high level bridge. 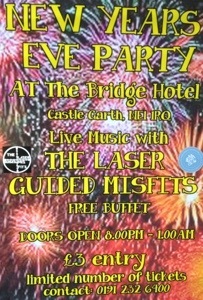 Never had a New Year’s Eve on a bridge before. 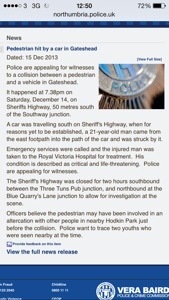 This entry was posted in Out and about on 31/12/2013 by garymoore. 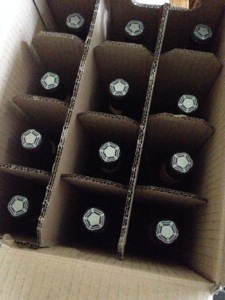 A box of Samuel Smith’s organic chocolate stout. My Christmas will be merry. And it’s just what our new coffee table was waiting for. This entry was posted in Family on 25/12/2013 by garymoore. Having to leave work at a sensible time has it’s advantages. 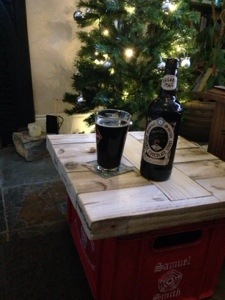 Not only have I collected a prescription (to ensure I’m not inhaler-less over Christmas), I’ve also made time for a bottle of stout in the Central. The red-topped table looks quite festive. Which reminds me of a picture I took on Saturday in town. 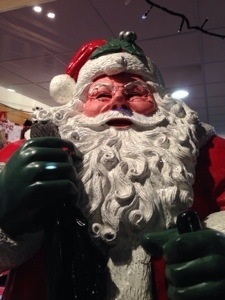 A Santa Claus in a shop window. Apparently wearing poundshop reading glasses. You’d think they could have picked up something more authentic (if there’s really authenticity in this case) easily enough on eBay. That’s where I buy most of mine. Bit disturbing though isn’t it. The Coca Cola Santa that is. This entry was posted in Pubs on 23/12/2013 by garymoore. I don’t understand how people can get their email address wrong. If they have a messy address, then fair enough, but if it’s a case of just their name with, say, a dot in the middle or a number at the end, then I’d say they have issues. Specially when they repeatedly give out the wrong address. Surely they must realise when no one replies? For many years, I’ve received emails with holiday photos, appointment details. A few weeks ago I even received another Gary Moore‘s life insurance policy by email. And his wife’s (I’m assuming) physio booking. There’s a Gary Moore at each of the above, several other variations too. Nowadays, I tend to delete the email, occasionally advising the sender if it looks important. Today, I received yet another. I might have to start copying them all here. Funny enough, I used to have an uncle George. This entry was posted in Technology on 20/12/2013 by garymoore. Went out for a meal with my team this afternoon/evening. Which was very nice. 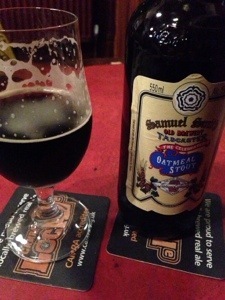 Sam Smith’s Imperial Stout may have been involved. Take heed, tis dangerous stuff. 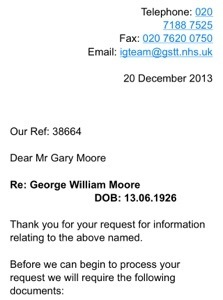 This entry was posted in Pubs, Work on 19/12/2013 by garymoore. I’ve been to a couple of gigs very recently and both were quite short. The View, on Sunday, were good; fast paced and nicely loud. But it was a pretty short set, out of character and unusual for a band with so much material. 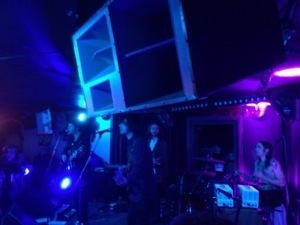 Still, they did play five Rebeccas so I can’t say I was disappointed. The following evening involved attendance at my eldest grandchild’s school carol concert. Mercifully, it too was short. Painful though. This entry was posted in Music on 18/12/2013 by garymoore. The last couple of New Year’s Eves were spent very happily in Charters, in Peterborough. Sadly, my second in command’s working pattern does not allow the several days needed to make the trip worthwhile. It seemed impossible to find an alternative that’d live up to Charters. And, today, I nave found a suitable replacement. Well, it’s my second in command’s most preferred venue in the Northeast. This entry was posted in Pubs on 15/12/2013 by garymoore. 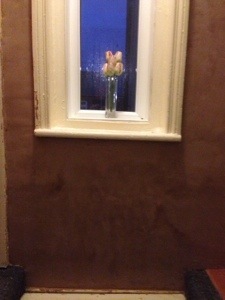 When a mate recently asked what I’d been up to lately, I mistakenly said I’d been doing some plastering. So yesterday afternoon was spent round their house. However, while not wishing to brag, or attract jobs in other houses, I’m getting pretty good at this. I’m now embarking on some Christmas shopping (which I know I shouldn’t leave so late). Town will be horrific no doubt. Then this evening we’re going to see the View. Which, followed by an early start tomorrow morning, may also be horrific. I suppose I could avoid alcohol. This entry was posted in House on 15/12/2013 by garymoore. Last night a child was killed in my street. Apparently he ran out from the park, into the road, and was hit by a car. According to someone in the street, he’d been hassled by some other kids in the park and he’d been trying to get away from them. This is all word of mouth, so may not be remotely accurate. But it’s a busy road and the Police did stop access for both traffic and pedestrians. So it does seem horribly likely. Addendum – the person in the street didn’t get it quite right. The victim was an 18-year-old and they were taken to hospital. They had been attacked in the park though. And now the correct version of events. Watching the Specials set from Lowlands 2010 on YouTube. I was there with the Phil. A rather good festival. This entry was posted in Music on 14/12/2013 by garymoore.